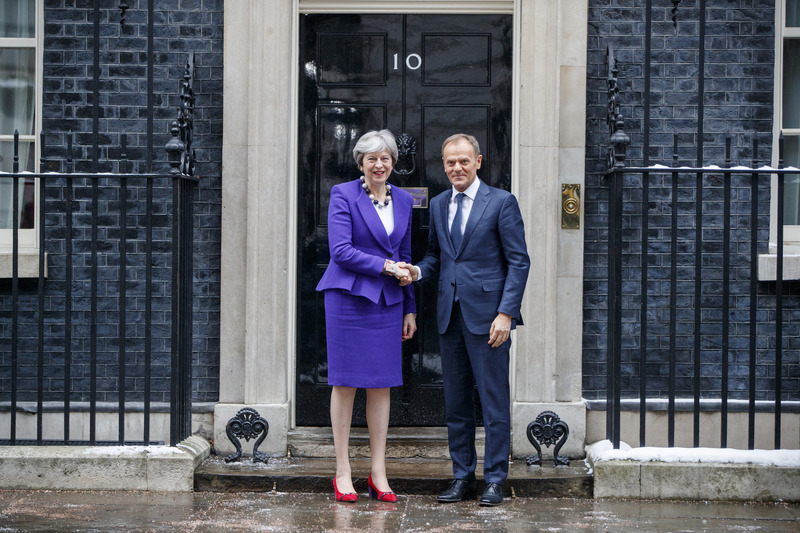 British Prime Minister Theresa May greets President of the European Council, Donald Tusk in Downing Street on March 1, 2018 in London, England. Britain has warned the European Union that if its negotiators do not urgently change their approach to Brexit, the bloc will face the turmoil of a “no-deal by accident”. The day that Britain is slated to leave the EU is just eight months away. And there is still much confusion. British Prime Minister Theresa May is struggling to clinch a deal with the EU. As reported by the Reuters news agency, May has stepped up planning for a so called “no-deal” Brexit that would see the world’s fifth largest economy crash out of the EU on 29 March 2019, a step that could spook financial markets and dislocate trade flows across Europe and beyond. Last week, the EU’s chief Brexit negotiator, Michel Barnier, said May’s new Brexit proposals contained constructive elements, though he added that many questions remain. In Berlin on his first overseas trip as British foreign minister since replacing Boris Johnson, who resigned over May’s new proposals, Jeremy Hunt delivered told reporters: “When it comes to Brexit there is now a very real risk of a Brexit no-deal by accident,” he told a news conference alongside his German counterpart Heiko Maas. “I think that many people in the EU are thinking that they just have to wait long enough and Britain will blink. And that’s not going to happen,” Hunt added. As reported by the Reuters news agency, both London and Brussels hope to get a final Brexit deal in October to give enough time to ratify it by Brexit day next March, though few diplomats expect the deal to be struck until months later. According to official data, more than half (52%) of Britain’s total $1.1 trillion trade in goods last year was with the EU and some investors have said such a chaotic scenario would seriously damage both the economies of Britain and the EU over the short term. “We want an agreement. And we also know that for that we have to make steps toward each other,” he said, adding that the EU’s collective interests had to be defended.